With a bit of food coloring and clever layering, regular (and delish!) sugar cookies are made fabulously festive for fall! Divide prepared sugar cookie dough into three equal portions. Leave one as is and color one other portion yellow and another portion orange. Line a standard loaf pan with plastic wrap. Gently press layer of uncolored dough into bottom of pan and smooth flat, keeping it at least 1/2-3/4 inches high (you don’t have to use the whole pan if you have a small batch of dough) or larger if desired. Layer orange dough on top of previous layer and smooth. Finally layer yellow dough and smooth on top. Wrap plastic over dough and chill until firm, 30-60 minutes in freezer or 1-2 hours in fridge. Or you can store the dough in fridge for 2-3 days before baking. Remove plastic and slice loaf into 1/4 inch slices. Trim top of slice to make straight line. 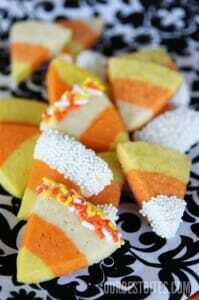 Cut each slice into triangle shape and dip top side in sugar if desired. Bake according to sugar cookie directions. Cool completely and then if desired, dip ends in almond bark or white chocolate and decorate with sprinkles.